I’ve been tracking my income and expenses for a couple of years now and you guys have been able to follow along since I initiated this blog last year. 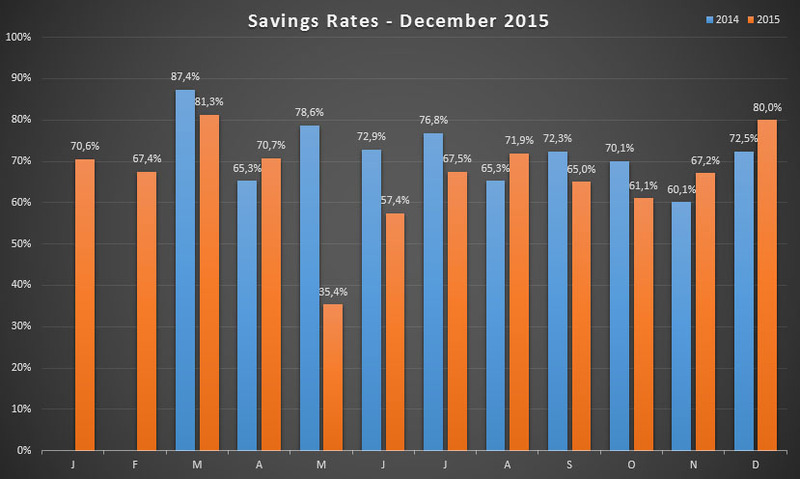 December marks the final month of the first full year I’ve published my savings rate online. To top my already awesome year off, this month’s savings rate was through the roof again! 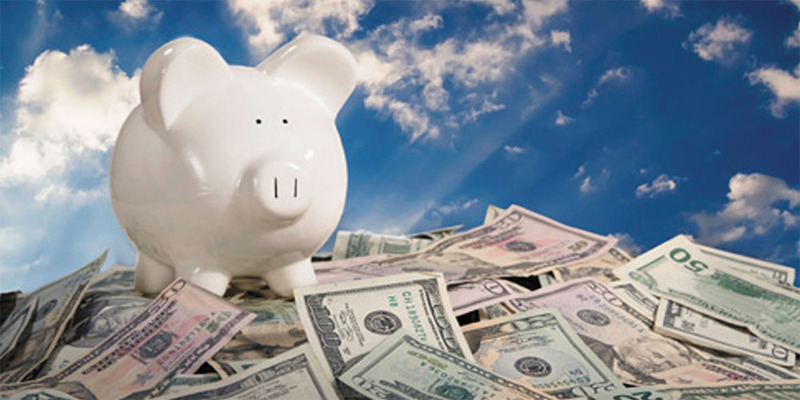 I enclose my savings rate online for two main reasons. First, I want to show everyone it’s possible to become financially independent on an average worker’s salary. I don’t earn a six-figure income and it’s unlikely I will ever belong to the 1% income group, but that’s not necessary anyway to reach financial freedom. By keeping my expenses low I’ll save as much as I’m able to. Second, I write these reports as a way to reflect on both my income and expenses of the past period – the entire process is somewhat cathartic. On top of that, it’s a live look for you at my journey, which hopefully motivates you in the same way as it does me to save as much as possible . You’d be surprised how easy it is to cut out non-essential spending when you’ve got over 5,000 people watching your every move online. So below you can find my income and every expense of the past month as detailed as possible without overloading you with information. If you’re interested in more details you can always ask me about a certain expense in the comments below. When tallying up December’s income, I count a whopping 5,000 Euros. I still can’t believe I made more than €5,000 in a single month! That’s the highest number yet, mostly due to a year-end bonus and a massive tax refund on top of my usual paycheck. However, the dividend income this month also upped the ante, to its highest level yet. At the current level, December’s passive income makes up almost 10% of my normal paycheck – awesome. The additional income is a nice boost to my savings rate so close to the end of 2015. What excites me more though is that I’m able to put all this extra cash through the compounding machine, mostly by investing it in dividend growth stocks and index funds. As a result, my income will be even higher next year. Whoa there, sailor! That’s a lot of money leaving your accounts, way more than usual at least. What happened? First, I stocked up on beer because I was all out – gotta keep my visitors hydrated, ahem. For those interested, I picked up two crates of Stella Artois and an assortment of bottles from Duvel, Gouden Carolus Tripel, Classic and Christmas, Guillotine, Tripel Karmeliet, Urthel Saisonnière and Samaranth, Gulden Draak, Wolf 9 and Chimay Bleu. Second, I purchased new winter tyres for my road bike. Because my Trek Madone 2.5 was still running on slicks I kept sliding all over the place in the rain, which is no fun. I expect this purchase to pay for itself in a couple of months though. Third and last, the “fun” category jumped up due to Christmas gifts and low-cost plane tickets to and from Dublin through Ryanair. I nevertheless managed to attain a savings rate of 80%, the second highest number this year! Only during March did I manage to keep more of my hard-earned cash in pocket, mostly due to an insurance premium windfall. December’s rate is furthermore the second highest since I moved out of my parents’ place and started living on my own. As a result, my financial independence fund grew by a massive €4,005. A large part of that money is going to be used to top up my savings accounts, but also to add some more dividend growth stocks to my portfolio – yes, I’m looking at you, Unilever (LON:ULVR). It’s interesting to see that no real conclusions can be drawn from the graph above, other than that my savings rate fluctuates from month to month. What I take away from it though is the fact that I remain within the 60% to 70% band during most months, which is most important to me. For the entire year I managed to save 67.3% on average. As you know, that’s under my 70% goal. However, I don’t mind one bit. Had I not purchased a new road bike I would have landed on 72.6%. All things considered an excellent result for 2015! For next year I expect to make the 70% mark without too much hassle. Strong income, helped by increased dividend payments for example, and lowered expenses should get me there no problem. Even if things don’t go exactly my way, 2015’s numbers have shown that I have a small margin of safety to play with. How were your December savings? Hit your goals? And what about your average savings rate for the entire year? I’m focusing a bit on increasing my exposure to healthcare, recently initiated a position in Novo Nordisk. Novo Nordisk is an excellent company too, but I just can’t get over the really low yield, especially after taxes. There’s more than enough other good stocks out there to add to my portfolio. If i remember your budgettracking excel correctly, you only add up the seperate saving rates for each month and divide this by 12. 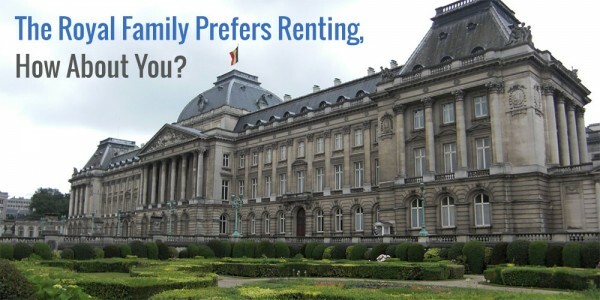 But wouldnt it be better to calculate your rate with yearly expenses and income? I believe you would reach your goal if u used that math, also makes more sense imo. Since months like these where you earn double (compared to other months) have the same “weight” as other months when calculating the savings rate like you do now. You’re right, the first version of the Excel sheet did exactly what you said, but that’s not correct at all. The average savings rate for 2015 is based on my total net income divided by my total expenses for the entire year, which comes out at the number above. Congratulations NMW, that is one impressive savings rate for December! Considering the bike is more of an investment than an expense, you made your target of a 70% savings rate in our book. Now go and have a beer (or did you drank it all? ), you deserved that. Don’t worry, the fridge is still half full – or half empty, depending on your point of view! Even though the numbers say I didn’t make the 70% mark, I feel like I did and that’s what’s most important to me. For 2016 I expect to make 70% no sweat. Wow that year end bonus certainly helped you getting such high savings rate. Congrats. More Unilever shares would be awesome. Good job man, I am following your progress with great interest. I think I am going to somewhat mirror what you are doing as well. I do have a question though. You are investing in a lot of different companies yourself, does it make send for a beginner to look at Vanguard Dividend Appreciation ETF (VIG) or VYM. I think they have the same goals as you do right? Anyway have fun in Dublin! Glad to hear you’re enjoying the journey I’m on and that I’m inspiring you even the tiniest bit to do something similar! 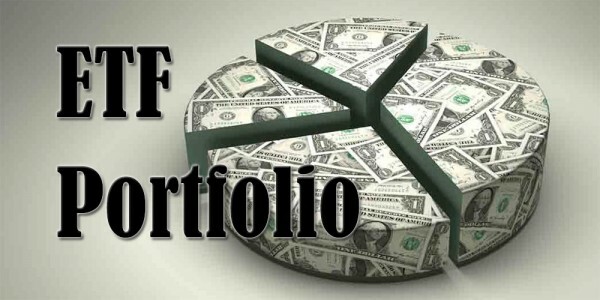 If you don’t have a lot of funds available to invest a dividend appreciaten ETF is a good option indeed. The goals of the index are similar to what I’m trying to achieve, but the ETF is based on market capitalisation. You’ll see, for example, that MSFT is the largest holding simply because it has the largest market-cap. There are some advantages and disadvantages to this approach, but I prefer to define each individual stock’s weight in my portfolio when it comes to dividend stocks. Dublin will be a lot of fun, no doubt! Just wanted to chime in: You can’t go wrong with VYM or VIG if you’re starting out and haven’t bought stocks before, in my opinion. It takes away the worry / second guessing about “how do I decide which stock to buy this week?” and you can start getting a feel to how you react when the market prices fluctuate. You have been maintaining a very strong savings rate! Keep that up in 2016. Although fun-stuff keeps the rate down by a little, I think it is very important to have some fun once in a while. This way it is easier to maintain the lifestyle and not to splurge when feeling down a bit. I like to make citytrips as well on a low budget. For my own goals, I would refer you to my blog. Absolutely! I wrote two posts about not skimping out on having fun with friends and spending money on things you love doing – cycling in my case. Gotta love those low-cost city trips in Europe, right? I sometimes can’t believe I’m half-way across the continent for just €20. The mind, it boggles. As you know, I already read through your blog. Impressive savings and promising start! Your saving rates are so impressive!!! I admire your great effort to pursue this goal from 2014 until now. I apply your concept into my excel sheet and I am totally surprised myself about my saving rates during my last 4 years. 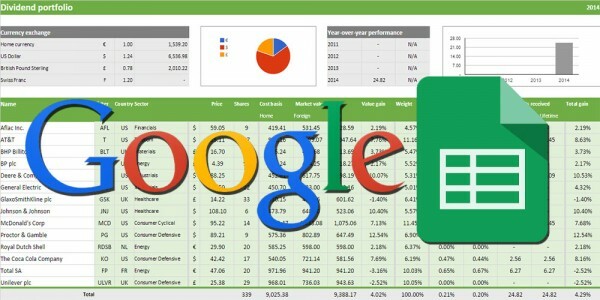 You had a valuable idea and explain this useful tool and share it to the community. Carry on this way and try to achieve more ambitious objectives for this coming 2016. Thanks! I’m really proud of my savings rate and the fact that I manage to keep it around the 70% mark on average. Glad to hear you are also tracking your income and expenses, and are finding you keep a lot more in pocket than you previously thought. Keep it up and you’ll be financially independent in no time. Great job on the Beer category spend 🙂 I think I should add “Groceries:Beer” into my Quicken file. Your savings rate is fantastic! Your 2014 had one 80% month; 2015 had two 80% months so here’s to a third 80% month in 2016! For tax refunds and salary bonuses I actually remove them from my monthly percentages. I try to keep the monthly comparisons consistent with each other so that I’m comparing apples with apples, and it encourages me to not expect or plan on receiving a refund or bonus that I might not receive. As you can imagine, I’m really happy with my savings rate, even though it could have been a bit higher for the entire year. And the best part about it is that I’m not even trying overly hard to achieve it! Three months with 80% in savings – now that would be really awesome. The odd jumps in the monthly reports due to bonuses and tax refunds tend to pull the average numbers up quite heavily, so I understand why you keep them from your monthly percentages. I keep them in so I don’t forget them when calculating my savings rate for the entire year. Besides, I never really “expect” a bonus or tax refund because they amount to nothing more than additional savings. I nevertheless think I’m going to try your method for a couple of months too and see if it changes anything! Very impressive I have my eyes on ULVR as I need to invest in more European quality stocks, as I am heavy on US ones and need to balance my portfolio. Unilever is an awesome business and I highly recommend looking into them if you wish to pick up more quality European companies. Be sure to check out the analysis I just published. Don’t worry – Dublin will be a lot of fun. It’ll be my third time there and since I’m staying with a friend I can keep costs down without too much trouble. I expect my entire weekend will cost between €50 and €75 on top of the plane tickets. And I’ll definitely enjoy a couple of Guinness! As that way you are not loosing to currency exchange since all transaction would be in. Euro, I would be interested to know why or was it that just the symbol you copied ! The reason I buy the ULVR shares of Unilever is explained in the analysis I referred to in my previous comment. It basically comes down to the fact that ULVR share dividends aren’t taxed whereas UNA dividends are taxed at 15% by the Dutch government on top of my 27% income tax in Belgium. Wow, those values are pretty impressive! But I see your cost of living is quite small. Are you planning to buy a house someday? Thanks, I try my best to save as much as possible! Someday I might buy a house, but for the time being I enjoy my living situation. It’s cheap and close to almost anything I might need. On top of that I don’t need a car.